US scientist Charles Zimmerman determined that a helicopter rotor could work just as well if put below a vehicle as above it. 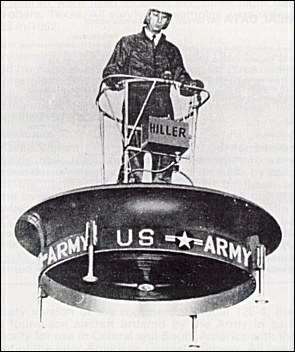 After a scary-looking device with uncovered blades called the De Lackner Aerocycle was flown, the Hiller Company built the VZ-1 Pawnee. Second and third versions, each with a larger, deeper rotor duct were built. The third was so large that kinesthetic control was ineffective and it had a seat and conventional helicopter controls. These designs flew well enough, but the army judged them to be too small, slow and of limited usefulness and practicality for combat service. In late 1953 the U.S. Navy's Office of Naval Research (ONR), acting as technical direction agent for the Army, awarded Hiller Helicopters a contract for the development of a twin-engined ducted fan VTOL research vehicle of the 'flying platform' type. The craft was intended to explore both the practicality of the ducted fan as a propulsion unit for V/STOL aircraft and the potential military value of the flying platform as a tactical reconnaissance and transport vehicle. The first prototype of the Hiller machine was completed in September 1954 and given the interim, non-standard Navy designation YHO-1E. 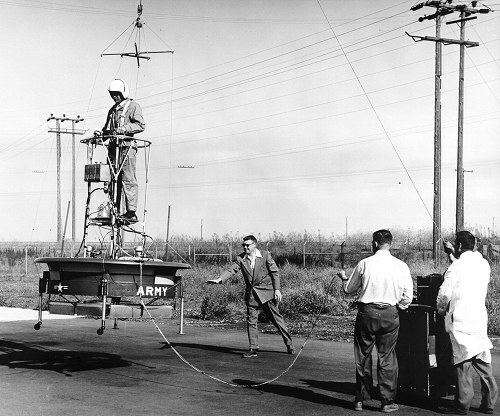 The vehicle made its first non-tethered flight in February 1955, and shortly thereafter was redesignated VZ-1. The first VZ-1 prototype bore a superficial resemblance to the contemporary De Lackner HZ-1 and, like that machine, carried its pilot and twin 40hp engines on a small circular platform directly above two contra-rotating airscrews. Unlike those of the HZ-1, however, the Hiller machine's fans were mounted inside a five-foot diameter duct, beneath which were fitted eight moveable vanes used to improve the craft's lateral stability. The VZ-1's pilot stood upright just behind the narrow control pedestal, to which he was secured by safety belts, and held onto a set of bicycle-like handlebars fitted with a simple twist throttle and a propeller torque control. 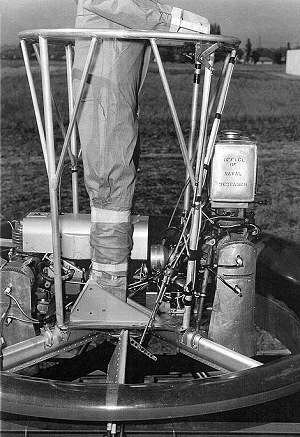 The flying platform was kinesthetically controlled; to initiate directional movement the pilot would simply lean in the desired direction and alter the craft's altitude by increasing or decreasing engine power. 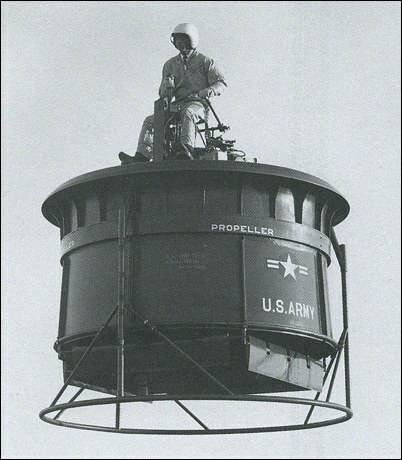 The Army was favorably impressed by the VZ-1's performance during the initial ONR-managed flight test programme, and in November 1956 ordered a single modified example for service testing and operational evaluation. This second VZ-1 differed from the first example in having a third 40hp engine, an eight-foot diameter duct without lower control vanes, and a simplified control pedestal. The second Pawnee (serial 56-6944) made its maiden flight in 1958, and the following year was joined in Army service by a third, further modified example. This third VZ-1 (serial 56-6945) had a duct of greatly increased height, a single circular landing skid instead of the three- and four-point wheeled landing gear of the earlier craft, conventional helicopter-type flight controls, and a seat for the pilot. The VZ-1s provided a wealth of valuable information about VTOL flight in general and the value of the ducted fan in particular, but ultimately proved to be too ungainly, too heavy, too slow, and too mechanically delicate to be of any real value on the battlefield. Further development of the type was therefore suspended and all three types had been withdrawn from service by 1963. I admire the inventor of this ?Hiller flying platform,but?its noisy and loud,can an electric model be possible?that would surprise our enemy ,The Terrorist and Communist?and how long would a battery last,for this Flying Plat Form,if it is electrified? and here I thought You only needed a single engine for a single engined aircraft. je voulais savoir si vous pouvez s'il vous pla�t envoyez-moi les plans. Homebuilder of midget mustang, I ran in the general circle..It was once said to me that the hiller project was killed off by our lovely government. The thought at the time was that due to it's simple design and construction the government just did not want the people to have that (the hiller) kind of un-checked transportation freedom. I am training many fighters and giving them the ability to fly will make the bombs they wear MUCH more effective. Starting the design of a twin terbo jet version of the platform. Need investors for prototype and possable mass production. I am a design engineer that can make it work! Go to Google Patents and type in "flying Platform." The original patent can be found there. It is fairly detailed. A mechanically-minded person could build a flying model from the patent. But remember it needed both engines to offset the torgue and fly. If one engine failed it would crash. A balistic parachute would be a necessity! Are any plans available for the Hiller VZ-1 Pawnee, and if so are they for sale? Please send blueprints to me. IT CAN BE DONE MOCH EASIER AND MORE EFFICIENT. does anyone got CONCRETE plans, well-detailed and correct? I WANT TO KNOW IF THE HUMMINGBIRD IS STILL AVAILABLE FOR SALE? AND IF SO HOW MUCH? Hope someone can help out ! � The lifting effect of the fan ring made the VZ-1 self-righting and very stable. It also made it hard to tilt in the direction of travel, reducing its potential speed. � The original model could not climb out of ground effect, which was the same as the rotor diameter, about 1.5m. This caused a lot of dust and flying debris. � Using Bernoulli's principles, the Pawnee achieved 60% of its lift from air moving over the fan's leading edge. The rest was generated directly by the propellers.